Manny Pacquiao’s return to the ring sometime this year has been on been ongoing saga on whether the proposed bout with Argentina’s Lucas Matthysse (39-4, 36 KOs) will actually pull through for sometime this summer. Reports of strain relations between Pacquiao and Arum should come to no surprise as there were signs prior to Pacquaio’s fight with Jeff Horn in Australia. The Pacquiao camp caused a stir in recent weeks as they announced to boxing press that Pacquiao is currently a free agent and no longer contractually obligated to Top Rank. “I reviewed the contract and I found out that Bob Arum has no more say even in the rematch, should there be any between Manny Pacquiao and Australian boxer Jeff Horn,” said Pacquiao’s lawyer Eldibrando Viernesto to the Philippine press. Furthermore, the camp also announced a date that has since been rescheduled at a site in Malaysia with the hopes of sealing a deal with Matthysse through his promoter Oscar De La Hoya’s Golden Boy Promotions. Pacquiao was reportedly insulted with the initial offer from Top Rank to perhaps be on a undercard to Horn-Crawford to fight Mike Alvarado. Manny rejected the offer and is now reportedly negotiating a fight through his own without the involvement of Top Rank. Pacquiao and Arum have been down this road before and it’s obvious that Manny had very little interest in fighting Jeff Horn last summer in Brisbane as he tried to set up a fight with Amir Khan in the UAE instead. 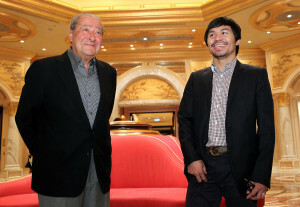 The fight fell through however, and Pacquaio was left to fight Horn as Arum didn’t seem to offer any other opponents. There are doubts that the Pacquiao vs Matthysse fight will pull through to a now rescheduled date of July 8. Aquiles Zonio who is Pacquiao’s media relations officer has made allegations that promoter Bob Arum has in the past threatened to sue some of the financial backers for which resulted in the fights being scrapped. Accoring to Zonio, Arum is trying to sabotage the Pacquiao vs Matthysse fight in Malaysia by threatening a lawsuit to the Malaysian financial backers. It’s going to be an interesting next couple of weeks on finding out whether Pacquiao is truly a free agent and whether Bob Arum can once again convince Manny to get back on board and fight an opponent of his choosing instead.